As morning came, we boarded the steam train for the two hour journey to the south rim of the Grand Canyon. Boy made a friend quickly, on the train. He wasn’t allowed to use my computer, so he immediately found another boy about 8, with a game system, and they spent the entire train trip glued to the screen, oblivious to the musicians, “train robbers”, and scenery. At least the adults were able to look out the window. 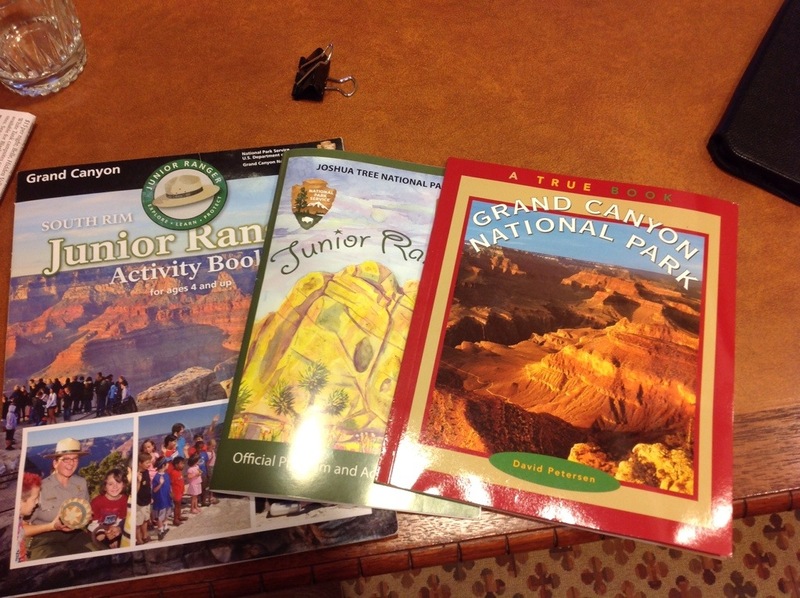 Once at the rim, we had a chance for some walks, sightseeing, and more Jr. ranger activities. An endangered condor soared overhead of our walking trail and led to a lengthy chat with a ranger on the condor’s habits and return to the wild. Boy declared that the Grand Canyon was bigger and “cooler” than Meteor Crater. As evening fell, the grandparents babysat, so we adults were able to slip out for a bit and see sunset over the canyon. We stayed the night at a lodge on the rim and managed to get out again for sunrise.